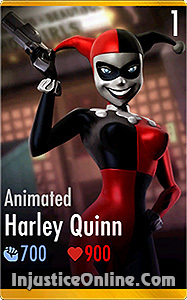 Bio: The Animated Harley Quinn is inspired by the portrayal of the character in DC Animated Universe. She first appeared in the show Batman: The Animated Series in the episode Joker’s Favor and has frequently appeared ever since. She is The Joker’s henchwoman, girlfriend, and previously his psychiatrist at Arkham Asylum. She has also appeared in The New Batman Adventures and Batman Beyond. Deranged Cheerleader: Harley and her teammates receive +20% DAMAGE and POWER generation, +40% for Joker characters. Hammer Slam: A barrage of lead follows a surprise attack. Bag-o-Tricks: Harley performs one of three RANDOM EFFECTS: Team Damage Boost, Unblockable Bomb, or Team Health Gain. Mallet Bomb: A mallet. A Bomb. That’s what Harley uses to smash her opponent. UNBLOCKABLE. Poison Ivy: +10% Health for all Harley Quinn characters. Harley’s Mallet: +10% Damage for all Harley Quinn characters. Mr. J: +10% Energy Regeneration for all Harley Quinn characters. Animated Harley Quinn is very useful character in combination with Joker characters as she will increase their stats by 40%. Her Passive and Special abilities can benefit each team member. She is capable of increasing health, damage and power.